With your extraordinary help, the youth of St. Paul’s were able attend the 2018 ELCA’s Youth Gathering in Houston, Texas. We were a group of 11 that included 8 students and 3 adult chaperones. We joined up with a larger group of students and chaperones from across Carroll County, making our group a total of 50 people. On our first day in Houston, we had some free time so we enjoyed a visit to the Houston Space Center. The group enjoyed a tram ride around the grounds learning about the history of the Johnson Space Center and ending with a stop at Rocket Park to view the actual Saturn V rocket. It as an amazing tour. The evening concluded at NRG Stadium with the first Mass Gathering where we enjoyed hearing several speakers along with some great musician, including the Gathering’s House Band. We were also introduced to the ELCA Presiding Bishop, Elizabeth Eaton. It was a great night to kick off the Gathering. Our first official day of the Gathering was our Community Service Day. 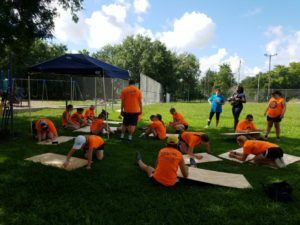 We were tasked with removing trash, weeding, and creating artwork for a community park and baseball field in Independence Heights, Houston. In 1915, 600 residents worked together to form their own municipality called Independence Heights. It is known as the first city incorporated by African Americans. We had the pleasure of meeting many great people that grew up in the community and are still cleaning up after Hurricane Harvey. Brianna points out that “Many people don’t realize that people in the Houston community are still fighting the aftermath of Hurricane Harvey; I didn’t realize myself how bad things were for these people until we went to Independence Heights to help out. Mrs. Tanya, one of the community members that helped our group on our service day, even told us how she just moved herself and her son from their hotel room into an apartment because their house was still unlivable and the continuous hotel stay was becoming too demanding on her son’s mental health. 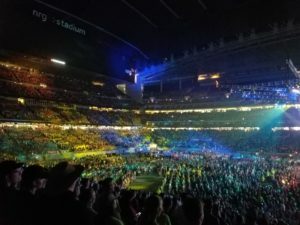 That evening and each evening after that, was concluded with a Mass Gathering held at NRG stadium. 30,000+ youth, volunteers, and adult chaperones gathered each night to listen to great music and inspiring speakers. Ben really enjoyed the speakers and how they spoke about relevant topics for today’s youth. His and Ashley’s favorite speaker was Pastor Nadia Bolz-Weber. You can view her speech and the other inspiring speakers on YouTube at https://www.youtube.com/results?search_query=youth+gathering+speakers. Our second day was our Interactive Learning Day. During this day, participants encounter God through a variety of learning styles and sensory experiences. We watched a virtual realty video presented by ELCA World Hunger on the “Seeds of Change in Malawi.” With the virtual reality glasses, you felt like you were standing right with the family in Malawi. You can check it out too by watching the YouTube video: https://www.youtube.com/watch?v=o8_-78PWi94. During the Interactive Learning Day, Ashley donated 8” of her hair to “Children with Hair Loss” who provides human hair replacements at no cost to children and young adults facing medically-related hair loss. Throughout the day, everyone enjoyed collecting pins and bracelets from organizations and other youth from across the country. It became a competition to collect the most; Andy was the winner with 14 bracelets! The third day was our Synod Day. It was a great day of worship, signing, and getting to know our “neighbors” from the Delaware-Maryland Synod. Ben liked the way our Synod Day was organized differently than it was in Detroit, we had a lot more interaction with other youth in our Synod. We also had the pleasure of meeting our Synod bishop, Bishop Bill Gohl. All of our youth (and adults!) had an awesome experience. Ashley enjoyed all of the speakers and was inspired by their vision and heartfelt advice. Andy thought it was really cool how 30,000 people from all across the country came together for one great cause. Ben had fun doing all of the activities with the kids from St Paul’s and has some great memories from out time in Houston. We hope to see more St. Paul Youth at the next gathering held in 2021 in Minneapolis, MN. Check out more of our pictures on St. Paul’s Facebook page. Check out this video of the 2015 ELCA youth gathering made by one of our own!